Pretty neat, isn’t it? I’ve seen things like this before and I think it’s a great idea, so I decided to make something like it myself! Let’s get started. Begin by lightly sketching a rounded rectangle onto your paper. Fill out the horns, and add a small teardrop-shaped beak. Make the eyes. Don’t make either the iris or the pupils complete circles for a more realistic look. Now the fun part! If your sharpener is already full of colorful shavings, you can use those, but otherwise you’ll need to sharpen some bright colored pencils. Turn the pencil slowly and firmly to get a nice shaving. My pencils were already so sharp that it hardly worked to sharpen them again, so your feathers might look different (and better!) than mine. Glue them on from the bottom up, overlapping the shavings as you ascend the owl’s body. I really should have added the wings first because they were hard to color in without breaking off the shavings, but oh well. XD Now add two parallel curves on both sides for wings, and two little feet holding on to a branch. If you took my advice and skipped #7, go back and do it now. Nothing very complicated or impressively realistic, but fun for different, I think. 🙂 I love how the colored shavings pop against the gray graphite, don’t you? Oh, and I covered my ATC with packing tape to protect the feathers once I was done, but you don’t have to if yours are glued down well enough. What do you think? Did it turn out pretty cute? 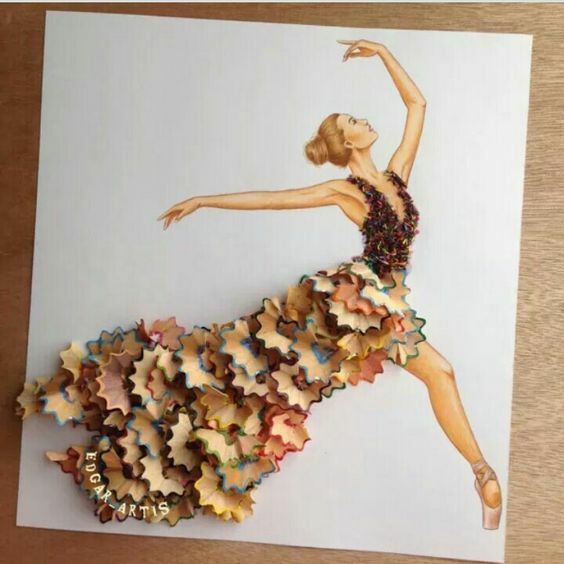 Have you ever used colored pencil shavings to make art or used an art supply in an unexpected way? Thanks for reading, dears, and have a lovely day! Thanks so much, Livy! I know, owls are pretty cute. 😀 And yeah, I thought so too! Wow! So creative,Allison! Never thought of it that way! Thanks, Sapphire! Ah yes, owls are great. And YAY, I hope it turns out well! Very clever and beautiful owl ! Your oh so very welcome!! That’s really pretty! You did a great job! Oooh, now my creative juices are running all over the place….flowers, birds, animals….. This is such a unique idea! The drawing of your owl turned out really nice too! Also, I recently sent in an email to the art lab of the popsicles I painted with your tutorial. Did you get it? Thank you so much, Gracie! Oh dear, I’m not sure… the email wasn’t working on my computer, so let me ask Megan. But I hope we got it, because that sounds SO pretty! Thanks so much for sending it! Your owl is so cute! This is such a cool idea 🙂 Seems like fun too!